A Labour Party official who suggested Jewish "Trump fanatics" were behind accusations of anti-Semitism in Labour ranks has been re-elected to the party's ruling body. Peter Willsman was criticised when a recording of his remarks emerged in July, and the pro-Corbyn Momentum group withdrew its backing for him. But he is one of nine people elected to Labour's National Executive Committee. The remaining eight members of Momentum's slate were also elected. In his recorded remarks, made during a Labour NEC meeting, Mr Willsman also said he had never seen anti-Semitism in the party. He later apologised and said not all his remarks were accurately reported and that he would be referring himself for equalities training. Momentum founder Jon Lansman has also been re-elected to the executive committee. Comedian and longstanding Labour activist Eddie Izzard missed out, finishing in 10th place. The centrist Progress group put forward nine candidates but they finished well behind the Momentum slate, who were referred to by supporters on Twitter as the #JC9. Labour MP Wes Streeting, a critic of Mr Corbyn's leadership, said Mr Willsman's past comments should disqualify him from having any say over internal party rules regarding anti-Semitism. He told Channel 4 News that Mr Willsman should "do the decent thing" and refuse to take up the seat and, if he did not, the party should take action. While he acknowledged the left of the party had control over Labour's machinery, he said its "paranoia" was preventing the party from dealing with issues which were doing "extraordinary harm" to its reputation. But his fellow Labour MP, Chris Williamson, hailed the outcome as a victory over "the haters and the smearers". And Momentum said it showed the power of "ordinary members" to shape the direction of a "reinvigorated, democratic" party. Labour's NEC is expected to vote on Tuesday on whether to adopt, in full, the International Holocaust Remembrance Alliance's anti-Semitism guidelines. Labour's code of conduct, which does not include all of the IHRA examples of anti-Semitism, has caused a drawn-out row within the party. The Board of Deputies of British Jews said Mr Willsman had been "let off the hook" by Labour officials and Mr Corbyn should have personally intervened to rebuke him. 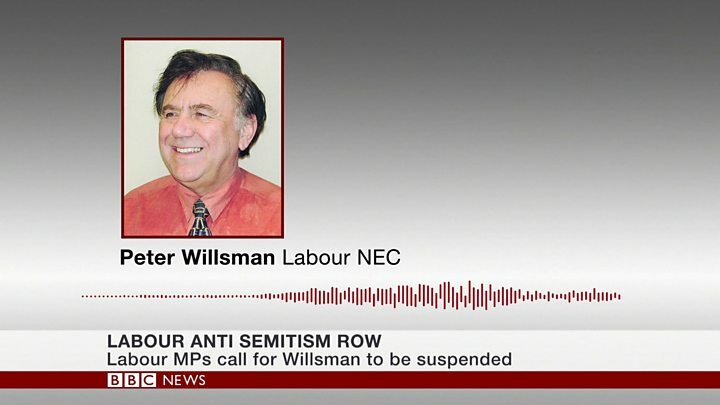 "The election of Peter Willsman to Labour's NEC following his reprehensible comments about Jews is deeply concerning," said its vice-president, Amanda Bowman. Speaking ahead of Tuesday's meeting, shadow chancellor John McDonnell said he backed accepting the IHRA definition in full, including all examples. But he said the right of Labour members to criticise the actions of the Israeli government and to advocate the rights of Palestinians must be protected, as long they used acceptable language. "I am hoping we can resolve it both in terms of the Labour Party but more importantly that we can then unite and work with community organisations - particularly from the Jewish community - to tackle anti-Semitism within our wider society," he said.